A solid and well-functioning Software Asset Management follows a perfectly agreed development plan, based on the needs of your company. This is the only way to positon SAM firmly in your company. Furthermore, the positive impacts of SAM, especially the aim of reducing license cost is achievable on a long-term basis. 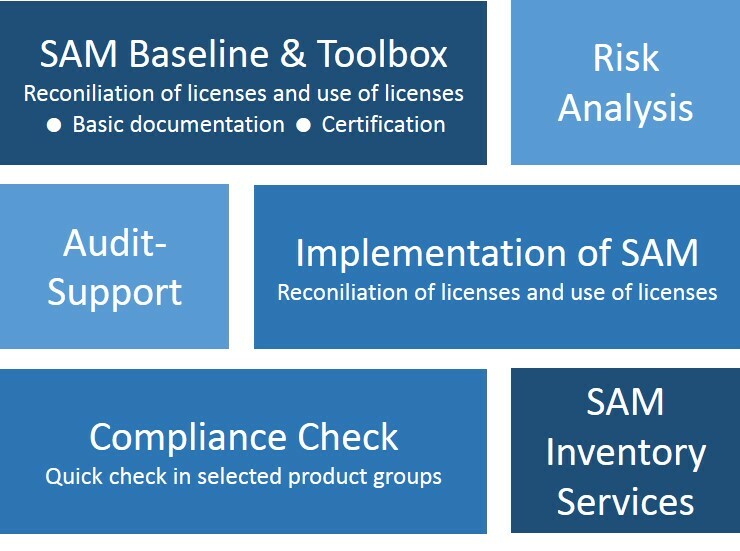 The building blocks that SAM consulting offers is adequate from a short-term deployment and immediate effective module like a risk analysis or a compliance check to a sustained implementation of a Software Asset Management system. if you click the respective module on the graphic above.